Bela Khotenashvili is a top player from Georgia and also one of the best female chess players in the world. She has recently achieved her best rating ever, reaching 2531 within the past year. Khotenashvili has won multiple women’s tournaments, including the Maia Chiburdanidze Cup and Women Grand Prix Geneva tournaments. Now that she has finished her norm requirements and acquired the full Grandmaster title, she is sure to keep improving and striving to become the best female player in the world. Bela Khotenashvili was born in the country of Georgia. She won the Women’s World U-16 Championship in 2004. She followed this up by becoming a Woman International Master in 2006 and a Woman Grandmaster in 2007. In 2009 she became a full International Master and in the same year she won the Maia Chiburdanidze Cup, an international women's open tournament. In 2012 she played in the FIDE Knock-Out Women’s World Championship but lost in the first round in a tiebreaker. In 2013 she came in first place in the Women Grand Prix Geneva tournament, earning her final GM norm and completing her title requirements. She achieved her peak rating in 2013 as well, topping at 2531. 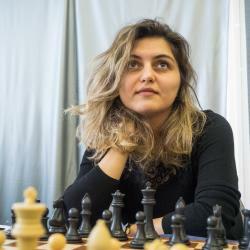 She is currently the 12th highest rated female in the world and also one of the top players in her country, Georgia.